LGEA Central from Kwara state and Baptist Primary School Osun State have scaled through to the final of the Channels International kids Cup. 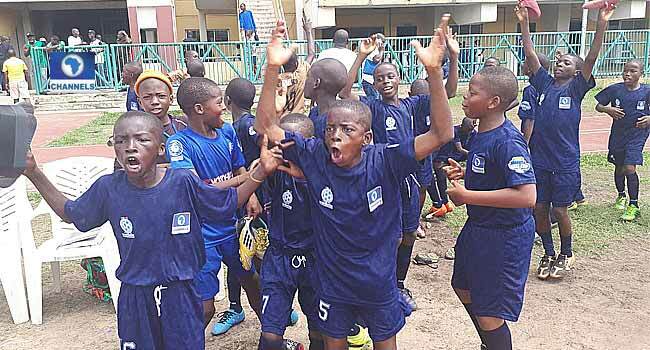 The Kwara boys beat Emmanuel Anglican Primary School five goals to two. Abdullahi Mubaraq got the opener for Kwara within three minutes and Isa Olarewaju made it two five minutes later. Olarewaju got his brace just before halftime. On resumption of the second half, the Kwara boys increased their tally to five with Mubaraq getting on the scoresheet again before Sunday Shola made it five. Alade Ayomiposi’s two goals for Emmanuel Anglican in the 29th and 35th minute turned out to be mere consolation. Meanwhile, the game between Baptist Primary School and X-Planter Primary School Lagos State ended goalless after regulation time. The game headed straight to penalties with the boys from Osun winning the penalties shootout six goals to five. Osun will then play Kwara in the final, while last year’s bronze medalist, X-Planter will take on the kids from Ekiti state in the 3rd place match.